"Does Hong Kong Remain an Equivalent Jurisdiction for the EU Credit Rating Regime?" 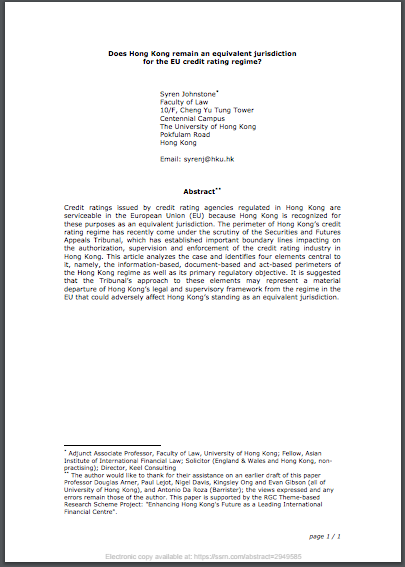 Abstract: Credit ratings issued by credit rating agencies regulated in Hong Kong are serviceable in the European Union (EU) because Hong Kong is recognized for these purposes as an equivalent jurisdiction. The perimeter of Hong Kong’s credit rating regime has recently come under the scrutiny of the Securities and Futures Appeals Tribunal, which has established important boundary lines impacting on the authorization, supervision and enforcement of the credit rating industry in Hong Kong. This article analyzes the case and identifies four elements central to it, namely, the information-based, document-based and act-based perimeters of the Hong Kong regime as well as its primary regulatory objective. It is suggested that the Tribunal’s approach to these elements may represent a material departure of Hong Kong’s legal and supervisory framework from the regime in the EU that could adversely affect Hong Kong’s standing as an equivalent jurisdiction. Click here to download the full paper.